It’s always raining money in Cashville! While it may be a fictional town notorious for only having the wealthiest of residents as neighbours, while you pass through billionaires Bill Bullion, Dame Von Deeds, Sir Sterling and Bette Boodle all strive to outdo each other by splashing the cash on visitors and showing just how generous they can be - so enjoy your visit as you could be leaving with up to 500,000 coins each time! 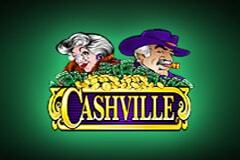 The Cashville slot machine has been developed by Microgaming and it is a classic from their library to this day despite launching way back in 2005, and while the graphics have been upgraded since the initial release, they still fall way behind the standards we have become accustomed to in the latest video slots that have been released in recent years. A piano is playing in the background as you hear lots of chittering and laughter in the background as though you are in a luxury restaurant, but the sound you will really want to hear is the ‘ka-ching’ of the till ringing as this sees your balance boosted each time. Consisting of 5 reels and 20 adjustable paylines, the number of coins you can stake enables you to stake between 20p up to a maximum of £200 so a visit to Cashville should be manageable for anyone rather than just the elite high-rollers amongst you! During your visit to Cashville you may be overwhelmed by the affluent lives that the billionaire residents lead, but they are only too willing to splash some of their cash your way. Each of the four characters you’ll meet in Cashville offer jackpots of 10,000 coins for finding five of them on a single line and they are all quirky characters with varying interests. Billionaires row sees you meet Bill Bullion who always wears a cowboy hat and is rarely seen without a fat cigar in his mouth, Dame Von Deeds is very posh and always wears luxurious fur coats, Sir Sterling dresses sharply in pin-striped suits, and Betty Boodle loves splashing out on expensive pearls and dogs. While you’ll enjoy getting to know the filthy-rich residents, it’s the golden ‘W’ door knocker that you’ll be crossing your fingers to see the most. This is the Wild symbol which could see you scoop the jackpot prize of 50,000 coins. There are two other special symbols on the reels with the Scatter bringing wins worth 8x up to 300x your stake, plus there is a Bonus symbol that could see you trigger the Cashville bonus game. On top of these there are four lower valued symbols which the Wild symbols can only substitute for with these being related to each of the characters. You’ll see Bill Bullion’s cigar and roll of cash, Dame Von Deeds pristine notes and broach, Sir Sterling’s stack of coins and bundles of cash, and Betty Boodle’s expensive pearls and a hefty wedge of notes! Landing the Bonus symbol three or more times at once sees you trigger the Cashville bonus game which will see you pick one of the four billionaire residents to receive a gift from – with up to 60,000 coins up for grabs in a very lucrative pick me feature. Bill Bullion offers you a choice of his oil rigs, Dame Von Deeds offers you the deeds to one of her properties, Sir Sterling gifts you one of his many bank vaults, and Betty Boodle lets you pick one of her highly valuable pieces of artwork. While most you will be grateful for whatever the four wealthy residents throw your way, there will be some of you who are simply greedy for more cash, therefore you’ll be pleased to learn that a double-up gamble feature has been included to allow you to risk your winnings for even more. You’ll see a playing card face down with you required to decide whether it will be red (diamond or heart) or black (club or spade) once it has been flipped over. Correct decisions will double your winnings, however tread carefully as incorrect choices see you kiss them goodbye! Cashville is full of billionaires so while you may feel out of place, they will soon take pity on you and lavish you with riches. While there are huge wins to be had, it’s a little disappointing that there is no free spins mode included, and for those of you who want to be filthy rich, check out the Mega Fortune slot machine as it boasts a progressive jackpot that could see you become even richer than the four residents you’ll mingle with during your visit to the town!